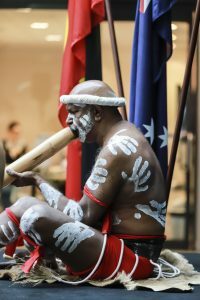 National Reconciliation Week (NRW) is an important occasion for the Department of Human Services to celebrate and deepen our understanding of Aboriginal and Torres Strait Islander culture. 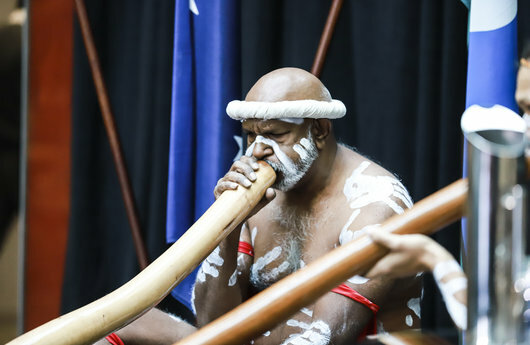 To honour NRW, which runs 27 May – 3 June, department staff enjoyed performances from Walangari Karntawarra and Diramu Aboriginal Dance and Didgeridoo at its annual ceremony in Canberra. Dancers told traditional stories of hunting, food gathering and Australian native animals through their traditional body movements, with some staff getting up on stage to share in the experience. 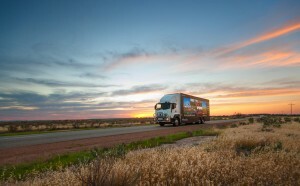 This year’s NRW theme Don’t keep history a mystery invited staff to reflect on our past and have a mature conversation about how we can learn from this to create a better future for all Australians. Director, Reconciliation Team, Andrei Leschev said the department had taken significant steps towards reconciliation since releasing its 2015-17 Reconciliation Action Plan (RAP) and would be even more ambitious in the next phase of its reconciliation journey. “We’ve had great success creating programs that improve career pathways for Aboriginal and Torres Strait Islander Australians,” said Andrei. “Our whole-of-government Indigenous Apprenticeships Programme – now in its fourth year – has helped create employment opportunities right across the public service. 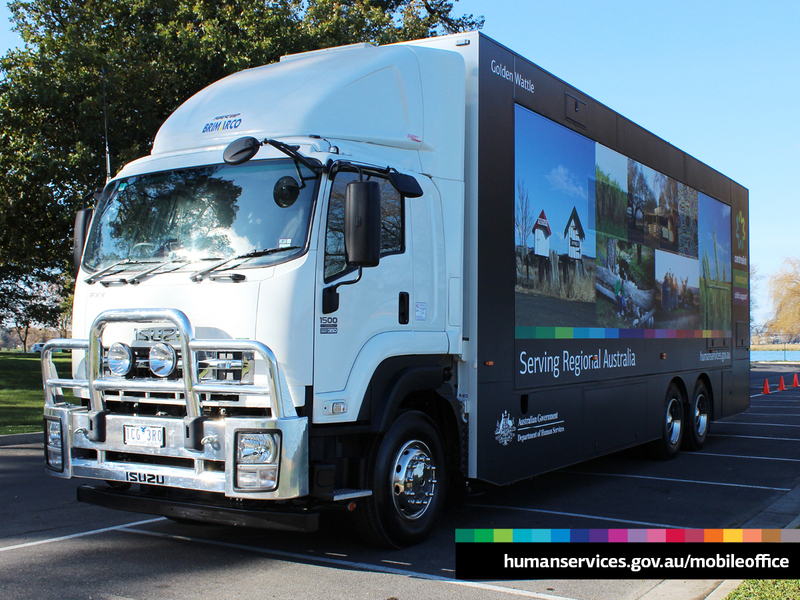 Last year this saw us surpass our Aboriginal and Torres Strait Islander employment milestone of five per cent. 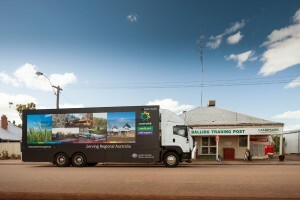 The department has also delivered Indigenous cultural awareness training to 16 other Australian Public Service (APS) agencies and established an APS Indigenous Champions Network of senior executives to advocate for Indigenous Australians. 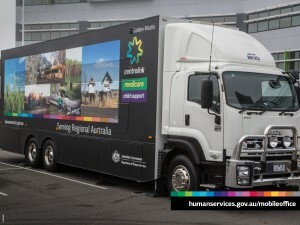 “By working with the department’s customers, staff, businesses and other Australian Government agencies, as well as Aboriginal and Torres Strait Islander people and the broader community, we can make a real difference in people’s lives,” said Andrei. 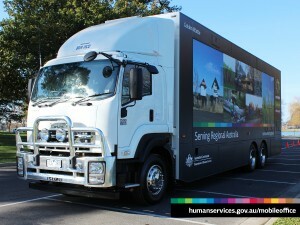 The Department of Human Services’ NRW ceremony was held at the Caroline Chisolm Centre on Ngunnawal land on Thursday 24 May. Read our Reconciliation Action Plan 2015-17.